Despite all the hype and the cliches about their attitudes to pets, the Spanish - and Canarian - people are animal lovers. This page will offer you information and guidance if you're emigrating to Tenerife and want to take your animal with you, or if you're already resident on the island and either want to get one or already have one. Let's deal with each in turn. Despite all the hype and the cliches about their attitudes to pets, the Spanish - and Canarian - people are animal lovers. This page will offer you information and guidance if you're emigrating to Tenerife and want to take your animal with you, or if you're already resident on the island and either want to get one or already have one. You should begin your campaign to get your furry friend to Tenerife several months before you're actually going. It can take that long! EU regulations state that an animal brought into Tenerife must be microchipped. You need to make sure the microchip meets the ISO Standard. You must also ensure your animal is vaccinated against rabies. This must be done at least 21 days before the travel date and after the microchip has been fitted. This is because, when the vet fills in the rabies vaccination details in the documentation, he/she has to include the microchip number. The next step is to get the animal a "Pets' Passport". The proper name for this as an Export Health Certificate and, in the UK, is available from the organisation DEFRA. When you eventually get through to your local office, ask for the "Export" department. Be sure to tell them how many animals you need to export, as you need a seperate passport for each. When you receive the application form, it will require you to state a departure date for your animal's flight. If you're not yet sure of this, just put "will inform". These passports, when issued, are only valid for 10 days, so, if there is any delay and the time expires, you'll have to apply all over again. When you send the completed form back to DEFRA, they will process it and forward it to your vet. You then need to take your animal to the vet's a few days before departure for an examination to ensure it is fit to travel. On successful completion of this, the vet will issue the relevant health certificates. There are very strict regulations on the size of the container in which an aminal will be transported. The required measurements are very precise. This must be at least as high as the top of the animal's head when standing erect. The width of the animal's shoulders, times 2. The box must be adequately ventilated, have a "handle spacer" and sticker marking the box as containing livestock and advising which is the correct way up. (This last may seem too obvious to be necessary, but you never know.) The floor of the box must be lined with absorbant material such as newspaper, or an old blanket. Straw is not permitted. You should attach copies of the pet passport and health certificate to the box. There should also be details of you - name, address and phone contact. Although some airlines will allow small dogs and some cats into the cabin with their owners (provided they are in a carrying bag of some sort), I don't know of any airlines servicing Tenerife that do this. Your animal, therefore, will be in the cargo hold. You should get your furry friend prepared for this potentially stressful situation by carrying out the following tasks. The day before travel, reduce the food the animal is given, but make sure it has enough water. As your pet will be going into the cargo hold, check in early, so that it can be put in a quiet, dimly-lit holding area, where it will, hopefully, become calm and relaxed. In the case of dogs, take them for a brisk walk before setting off for the airport - a tired animal is more likely to sleep during the flight. Another walk immediately prior to actual check-in is also a good idea. Most airlines ask that the animal is not fed at all on the day of the flight, but, conversely, in the United States, it is a legal requirement that it is given something light to eat a couple of hours before handing it over. All airlines strongly recommend that no sedatives should be administered under any circumstances. The chemicals act by lowering blood pressure. The effect of these, coupled with the pressurised effect of the cargo hold, could result in fatalities. You may find that airlines will refuse to take a sedated pet. You may see an animal advertised for sale. You visit the seller, meet the animal, then decide whether or not to buy. These are numerous in Tenerife. Known, in Spanish, as tiendas de animales, they usually stock a variety of dogs, cats, fish and birds, plus, perhaps, rabbits and hamsters. If you are new to living in Tenerife and decide to get yourself a pet, why not forego the Pet Shop and go to one of the animal sanctuaries? There are several excellent reasons for doing this - not the least being that you don't have to pay anything for the animal! Just giving it a loving home is thanks enough for these charitable organisations. Consider the poor animal itself, probably abandoned, being taken from a caged existence and accepted into the family home. Just like in any other developed country, pet owners should take good care of their animals. 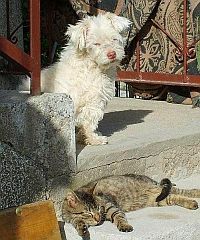 Dogs and cats seem to be the main creatures kept as pets in Tenerife, with dogs probably at the top of the list. All dogs must be microchipped and be periodically taken to the vet for their inoculations for things such as rabies, distemper and hepatitis. You'll find a link to a page regarding vets in Tenerife below. It is generally a good rule of thumb to always have your dog on a lead when taking it into a public place. Also, it is common courtesy to clear up any dog mess produced during a walk (although, needless to say, this isn't always done!). If you're immigrants to the island and have brought your dog with you, or if you've obtained one while you're here, there is a Spanish law that you should be aware of, regarding certain types of dog. Any dogs with a record of aggressive tendencies or prior attacks on humans or other animals. Different Town Halls may interpret these laws slightly differently, so it's always best to check with them, just to make sure. Something you may be interested in, should you bring your pet to the island or obtain one while you're here, is pet insurance, to cover you for vet bills, etc. Such insurance can make a lot of sense, as the cost of treatment at a vet can be exorbitant, just like any other country. I've found three options for you, so take your pick. As the name suggests, an English insurance service, based in the Las Chafiras area (just near Golf del Sur). Offering every conceivable type of insurance, they also deal with pets and will provide an annual policy costing 196 euros for dogs and 165 euros for cats. You can obtain full contact details plus other, more detailed information, by visiting their website. Based in Los Cristianos, this company insures pets for a yearly fee of 175 euros for dogs and 135 euros for cats. The only conditions are that the animal must be registered with a vet and microchipped. You can phone them on (+34) 922 753912. A Spanish company offering pet insurance. Unfortunately, their website is in Spanish, but if your language skills are up to it, you could consider approaching them. Some pet insurance policies will only cover you for public liability. Before parting with any money, make sure you are covered for vet bills, too.